Every patient brings a new orthopedic challenge for us which is how to successfully meet their unique expectations and needs. In order to achieve the perfect results, we devote our knowledge and skills to providing the orthopedic care that will change and improve the lives of our patients. While we always strive to provide the perfect combination of care, treatment, and support that patients look for, the patients struggle to find the doctor that will unconditionally help them to overcome the painful orthopedic struggle they go through. Mr. Wylie Weeks had experienced such a challenge prior to visiting Manhattan Orthopedic Care. After he landed on his shoulder while running to his acting class, he went through a horrible period because he visited several other doctors and emergency centers that didn’t recognize the severity of the shoulder’s swelling. One night, after waking up with excruciating pain, Mr. Weeks did online research for an orthopedic doctor in New York, and he found Dr. Armin Tehrany. He contacted the team at Manhattan Orthopedic Care and sent an emotional message, sharing his entire painful experience. Dr. Tehrany immediately recognized the agonizing shoulder condition that disturbed Mr. Weeks. His compassion and sincere care for people in physical pain led him to reschedule his day for a little bit in order to create free time in-between surgeries to examine and evaluate Mr. Weeks’ shoulder. As Dr. Tehrany expected, Mr. Weeks had a Rotator Cuff Tear that required urgent rotator cuff surgery. 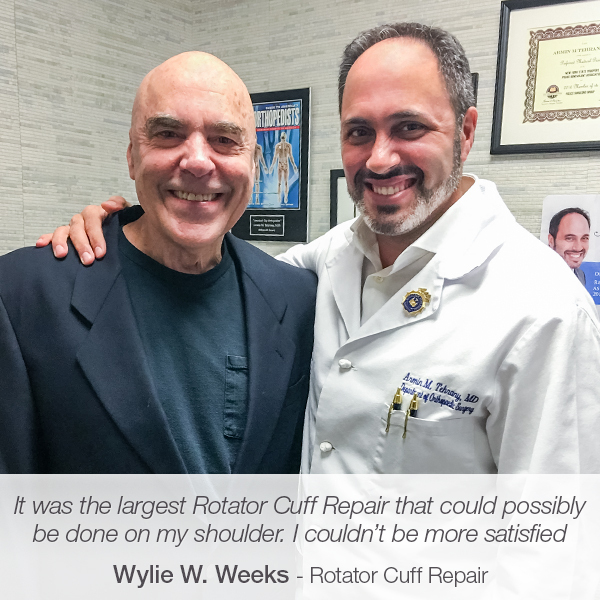 Since Mr. Week had already spent a lot of time in horrible pain, Dr. Tehrany recommended proceeding with the rotator cuff surgery as soon as possible. “I felt his pain through the message he sent, so we squeezed him in between surgeries just for an evaluation. It turned out he had a HUGE Rotator Cuff Tear that needed a major shoulder surgery. Six months after the surgery, Mr. Weeks is recovering better than planned and expected. Even though his shoulder is still recovering and there is plenty of therapy sessions to do to regain his maximum strength, Mr. Weeks feels happy and completely satisfied with the care and the treatment that Dr. Tehrany and his team provided. “I’m a 74-year-old male actor in New York City. I was running to my acting class in the rain and jumped a ditch on the corner. The leap was beautiful, the landing was another story. My foot landed in the corner curved out section that all NYC corners have. I went down so fast I didn’t have time to throw up my hands to break my fall. In the emergency room, the X-Rays showed no broken bones, but the swelling was getting worse by the hour. The doctor there said it would be two weeks for the swelling to go down before a doctor could do anything for me. I’ve never experienced so much pain. Even with Ibuprofen, I couldn’t sleep at night more than one or two hours at a time. It got so bad I called my regular Doctor who couldn’t see me but recommended that I see an Emergency Care Center. It was Friday night, three nights after the accident. They told me I better go to a regular emergency room because I could be getting something that had to do with pockets of muscles and tissue that are flooded with too much bruising. My chest, rib cage, and right arm were solid black & blue. The ER said I’d live and the swelling would probably be OK. The doctor gave me the name and number of a surgeon. The number was wrong. Nowhere on the net could I find his number or the number of the other doctor the discharge person gave me. Sunday night, between 2 and 3 AM, I got up from the pain again and found Dr. Tehrany. His website has a place where you can fill in information and request an appointment. I poured out my story. The next morning, 9:30 AM I finally got up and had a voicemail. When I heard Dr. Tehrany’s voice, I couldn’t believe it. A Doctor himself had called me back from a message I had typed on his website. He said he was concerned because I had been to the emergency room twice and would be willing to see me the next day if I could come to where he was operating. He would see me in between his scheduled operations. He walked out into the waiting area the next morning with a cup of herbal tea totally relaxed and smiling. I felt like I was looking at a Male angel. He was so kind. He walked me back into a room and examined me quickly. Two days later, I was in his office with an MRI scheduled for the next day. In the prep room, before he operated on me, he said he didn’t know if he would be able to fix my Popeye bicep muscle. He fixed it! I accidentally looked at the medical report that he gave me to give to my physical therapist that they recommended and they insisted I begin immediately. When I saw it, I almost wished I hadn’t. They had repaired three of the four ligaments in my right shoulder. It was the largest repair that could possibly be done on my shoulder. Today, 6 months after my operation, I have a complete range of motion. And I can begin more strengthening exercises to regain my maximum strength back in another 6 months. Dr. Steven Bouskila assisted Dr. Tehrany that January 13th and he gets a special thanks too. I could not be happier or more satisfied. I cannot say enough about Dr. Tehrany. I would highly, highly, highly recommend him. He’s the best of New York.